Building Specs: Accept No Imitation, Your Facility Deserves B.I.G. Please note, these are the general building specs for B.I.G. 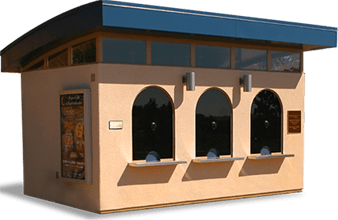 Customized Guard Booths. 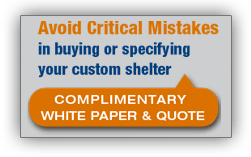 Many States require modifications to these specs in order for the booth to comply with individual State requirements for Energy Code, as well as State approval and third party factory inspections. 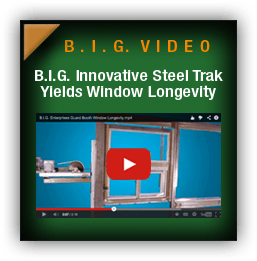 We urge you to call and speak to a well informed sales rep at B.I.G. to discuss your project. 2” x 2” x .083” for standard booth, 2" x 3" and 3” x 3” x .083” where energy code compliance is required. Framing is cold drawn electro-welded structural mechanical steel frames. Advantages: Frameless appearance, structurally superior to allow for manufacturing up to 220mph wind load. 16ga. Galvanized steel interior and exterior panels MIG welded between frame and mullions for self-aligning unitized system, creating a structural diaphragm. Walls to be insulated to a minimum R-10 for standard, R-17 for energy compliance. Note: Certain States require a added exterior layer of continuous insulation encapsulated in the a layer of 16ga. galvanized steel. 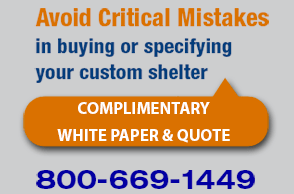 Advantages: Superior strength and durability, weather tight system for customized security booths. Unit to be all steel construction, designed for exterior use, insulated to R-19. Roof to have fascia and\or overhang as indicated on the drawings. Roof to be designed to drain through a gutter system with downspouts (if applicable) and to have a three part Energy Star membrane coating with a Solar Reflective Index (SRI) of 95 or greater. All booths that have roof dimensions of 6' x 8' or larger have removable lifting eyes for hoisting by crane. Advantages: Longer life in all weather conditions, heat reflective and energy efficient. Unit to have 12ga galvanized steel plate floor covered with black polyvinyl chloride interlocking toles and 4" base cove. Floor system is welded to a 2" galvanized steel tube frame and joists. Unit to have 1/4" steel anchor plates welded to the interior side of the floor frame with pre drilled holes for anchoring of unit. Floor to have all required cut outs for electrical, data & communication stub-ups. Advantages: Design flexibility for specific site conditions such as ADA. Galvanized steel framing and Galvanized steel joists is more durable and structurally superior. Polyvinyl Chloride interlocking tiles are comfortable and long lasting. Interior placement of anchor points is Architecturally superior, and safer as exterior anchor points are a tripping hazard. Unit to have one heavy duty steel framed sliding door constructed of steel tube frames and insulated 16ga. galvanized steel panels. Door to be top hung by a minimum of eight 2 1/4" steel ball bearing rollers in a steel upper track with lower stainless steel guide. Door to have stainless steel pull handles welded to the frame and mortise hook bolt lock. Advantages: Steel doors are more durable and standard for all customized security booths, B.I.G. is the exclusive provider of the rigid steel ball bearing roller system with welded stainless steel pull handles. Doors are more aesthetically superior and offer years of maintenance use. Unit to have steel window frame system with flush mounted corners and welded fastening. Unit to have fixed windows on all sides, all windows to be glazed with 1/4" tinted tempered glass. Advantages: Exterior painted galvanized steel window frames are Architecturally superior than aluminum, more durable and offer easier glass replacement. Most states with energy codes will require the units to have ¾” tempered dual pane insulated glass, however we recommend every exterior installation have this glass for better heating\cooling gain or loss. Unit to have all U.L. approved fixtures wired to N.E.C. standards. Units shall interior LED light(s) recessed in a 16ga. galvanized steel ceiling painted to match the booth interior color, and controlled by single pole wall switch or dimmer. 20 amp duplex outlet receptacles mounted under the shelf. All items to be wired to 125 Amp rated, 120\240 volt, 12 pole, 3 wire single phase load center. Advantages: Recessed lights offer more head room and are Architecturally superior, all booths are pre-wired to meet code. In addition to the standard conduits and boxes, unit to have empty 2" x 4" J-Boxe(s) mounted under the shelf with 1/2" empty conduit runs and pull string to the stub area for Data & Communication lines by others. Advantages: Provide raceways for typical items added to customized guard booths on site, now the booth already has these items ready for easy installation. Unit to have one interior painted galvanized steel shelf mounted on the front end wall. Shelf to be 20" deep mounted at 34" AFF. Advantages: Shelf is welded in place and provide for a minimum 250lb load. Many options available for shelves. Unit to have a commercial through the rear wall mounted unit that provides 12,000 BTU cooling and 11,200 BTU electric resistance heating at 230 volts. Booth to have a steel shroud painted to match the booth and a dedicated outlet. Advantages: Through the wall mounted air conditioners offer years of maintenance free use and have good warranty. Better heating and cooling capability vs. RV style roof mounted units, and far better warranty and servicing options. All seams and joints of customized security booths to be pressure bonderized, all openings to be fully weather stripped. Roof to have three part membrane. Unit to be electrostactically painted with RUST inhibitive coating system. Using a High build primer, and two part catalyst polyurethane finish coat. Overall system to have minimum 5 mil rating, and to carry a minimum of 3500 hr. salt spray test. Color to be specified by customer. Advantages: Best coating in the industry and the only one with documented salt spray test on the same metal used in the manufacturing. Computer color matching available or select one of our many standard color options. Units are shipped fully assembled, fully wired, fully glazed and thoroughly painted. Position units over electrical stub-up on level pad. Drill and set 4 Expansion type Anchor Bolts. Connect power and seal around edges where the floor base meets the concrete pad, and that's it. Careful attention and coordination of electrical stub-outs will save many man hours.